This second and final course in the PowerPoint 2010 series, really helps tie the previous course up and elevate PowerPoint skills to an expert level. Topics like creating & applying custom themes, adding & modifying action buttons and exploring the Broadcast Slide Show feature, are covered in depth. This PowerPoint 2010 Advanced training course can be delivered at your premises by one of our expert local or international trainers or live online using our HIVE technology. 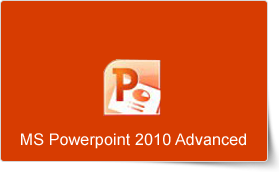 This PowerPoint 2010 Advanced training course running in Central and Hong Kong wide, is rated 5.0/5.0 in overall quality by ProCert Labs, builds on the skills and concepts taught in PowerPoint 2010: Introduction. Participants will customize PowerPoint by modifying the Ribbon and changing application settings. They will also apply themes and templates, and they will work with SmartArt graphics and tables.